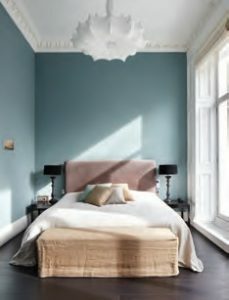 Recreating boutique hotel chic at home shows no signs of waning – Soho House has launched an interiors line on the back of their members’ love of hotel glamour. 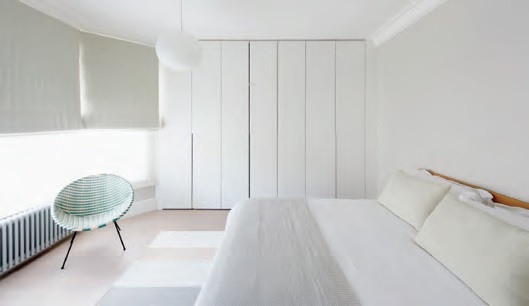 How you replicate this is not limited to one style – from pale simplicity to traditional elegance, riots of colour and pattern to restful natural tones, this is your private space to make your own. Mirrored wardrobes enlarge and lighten, accent chairs turn a bedroom into a suite, and upholstered headboards cement the room’s luxurious status. This restful bedroom is pale and interesting all the way – Bygga. 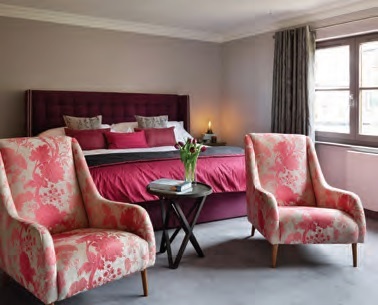 A warm colour palette, padded headboard and upholstered chairs channel a luxury hotel bedroom – Ensoul. 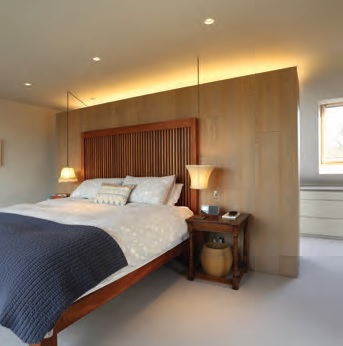 Emphasise tall ceilings with sculptural light fittings – Dyer Grimes Architecture. Clean, crisp furnishings with a splash of bright work well in a guest room – Plus Rooms. 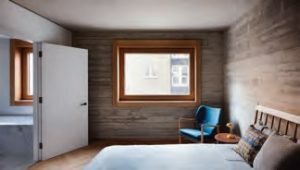 Cement and solid wood for a pared-down Scandi look – Allford Hall Monaghan Morris Architects. Minimalist look in cool grey with warm wood flooring – Minale + Mann. Downlighters over the dressing table and recessed lighting over the bed brighten this elegant bedroom – Multiserve. 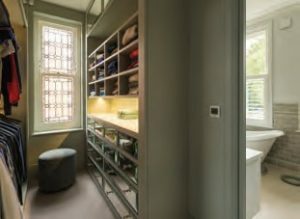 Not only do you need an en-suite bathroom but a walk-in wardrobe and dressing room is de rigueur nowadays. Cabinetmakers are busy creating the luxe look with high-end joinery to neatly store clothes, accessories and footwear. Remember to plan enough space to dress and, of course, a blank wall to install a full-length mirror. Dressing room behind sliding doors from Granit Architecture. Mirrored cupboard drawers in this dressing room from Qualitas. Floor lighting detail and high-end cabinetry create an elegant walk-in dressing room, from Barbara Genda Bespoke Furniture.